Kanzi observing visitors through the window of the greenhouse at ACCI. Teco on one of the climbing towers at ACCI. "There's about 80 of them [in the U.S.], and all the other facilities that house and care for bonobos in the United States are basically at or even exceeding capacity," says Taglialatela. "Our mission is science, conservation, and civic engagement... By getting certified by the AZA, and ultimately breeding our bonobos, we feel like we're positively contributing to all those aspects of our mission." Also joining the conversation is Mark Vukovich, president and CEO of Blank Park Zoo in Des Moines, and Val Hautekeete, zookeeper at Blank Park Zoo. 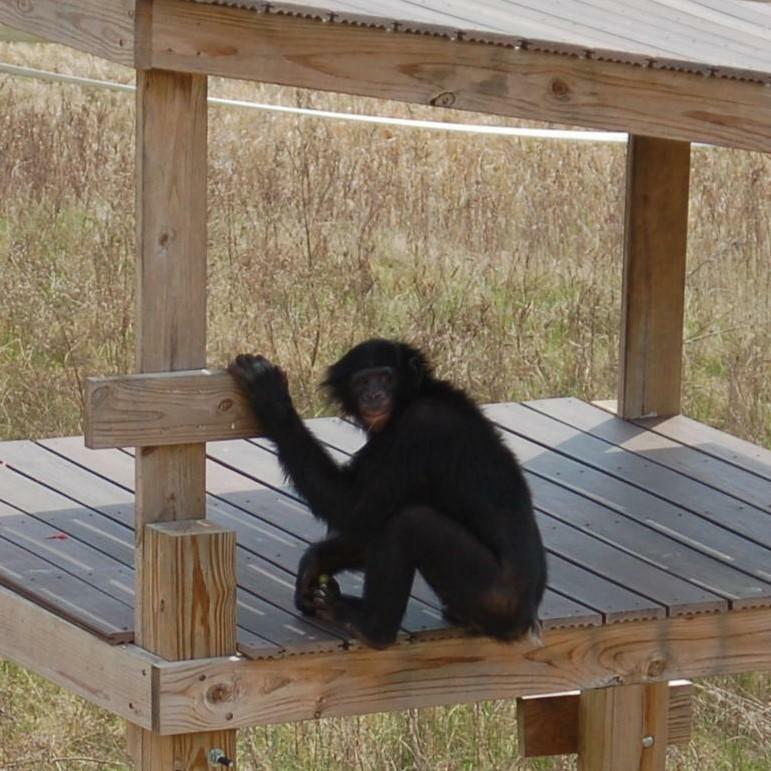 On today’s Talk of Iowa host Charity Nebbe and producer Emily Woodbury visit the Ape Cognition and Conservation Initiative in Des Moines, formerly known as the Great Ape Trust. The facility is home to a family of five bonobos including the world famous Kanzi. The bonobos can communicate with humans through the use of a vocabulary made up of lexigrams, symbols that stand for words. Through observation and carefully controlled study, human understanding of the behavior and intelligence of other creatures has grown exponentially over the last 40 years. Yet, there’s still so much unknown. In his new book, aptly titled, primatologist Frans de Waal addresses the provocative question, Are We Smart Enough to Know How Smart Animals Are? Charity Nebbe talks with De Waal about the extent of human understanding and how animal intelligence is studied during this Talk of Iowa interview.